If you’ve ever spent time in Nevada’s big cities, you know that whatever seems regular and mundane often… isn’t. It’s just a little bit off kilter in the best way possible. Even something as seemingly generic as mini golf has a few fantastic Nevadan twists to it. Next time you’re in the mood to hit some golf balls, check out these awesomely themed and unique spots throughout the state. Magic Carpet Golf in Reno, Nevada, offers a unique mini-golf experience. Opened in 1974, generations of mini-golf enthusiasts have discovered the magic here. They have a staggering 66 holes with hand-built, fantasy themed structures, perfect for kids and families of all ages. The Coconut Bowl at Wild Island in Sparks, Nevada are currently undergoing an expansion, but will re-open in late 2018. Don’t worry—the courses are worth the wait. 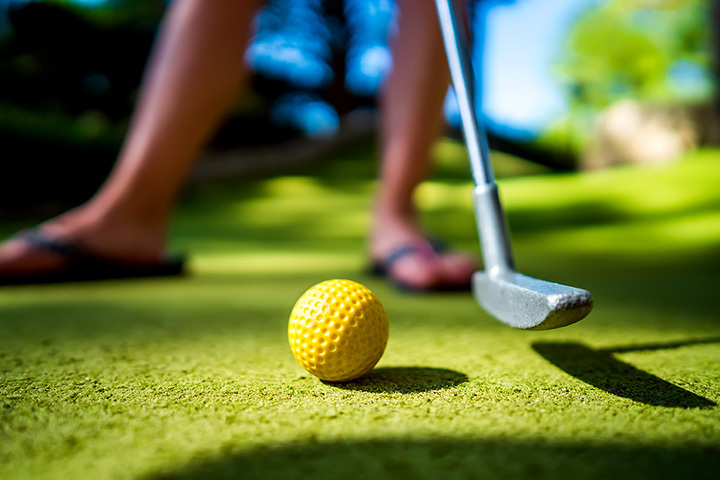 Golf among cascading waterfalls and rapid rivers on this 18-hole miniature golf course and enjoy the different scenery from fantasy castles to Egyptian pyramids. Do we have any Twilight Zone lovers in the house? Of course, we do. Twilight Zone is, in a word, boss. Whether you’re a fellow Twi-head or just like a unique mini-golf experience, the Twilight Zone Blacklight Mini Golf spot in Las Vegas is the place to go. Check this unique place out in the Bally’s Hotel and Casino in Las Vegas. Mini golf lovers visiting Vegas are in luck. Not only can you visit the Twilight Zone, but you can have a full-on KISS experience at the Rio All-Suite Hotel and Casino where the mini golf is KISS themed. According to their website, “KISS by Monster Mini Golf location is a unique 13,000 square-foot attraction that showcases an indoor glow-in-the-dark custom-designed, rockin’ 18-home” course. Now that’s rockin’, dude. Grand Adventure Land has one goal in mind: to make sure your trip to the Sierra Resort and Casino is one for the ages. That’s why they have go-kart racing in addition to thrill rides and mini golf for the whole family. Their 18-hole course includes “a park-like setting with three ponds, two waterfalls, and two streams,” as well as nighttime play. Need 2 Speed is another great Reno destination for family fun. While their focus is on go-karting, the fun doesn’t stop there. Check out their blacklight mini golf for only $6 a round. Have a hankering for mini golf but not quite in the mood for a flashy theme like KISS or the Twilight Zone? Never fear — Rex Center is here. This dinosaur-themed Las Vegas attraction offers “indoor electric go-karts, laser tag, mini-golf” and wall climbing.